A decade ago, a great fireball streaked across the sky, traveling over the Pillars of Hercules, past Rome, and impacted deep into the wild lands beyond Roman control. As it went, the shooting star broke up, dropping fragments all across its path. Where these smaller pieces landed, dead men got up and rose from their graves, got up off the battle fields, and took arms against the living. To make matters worse, the newly dead—whether killed by the restless dead or more earthly causes—rose up to join the macabre host. Life changed in Rome. Bodies were no longer buried or kept for viewing. They were cremated; their possessions given back to their families; their armor returned to the Legion. Plague followed in the poorer parts of the cities, leading to yet more uprisings of the newly dead. Rome eventually put down its local dead, but no sooner had it done so than a great rotting horde approached from beyond the lands of the Huns. Still, life carried on, and Rome survived. After the death—some say assassination—of Emperor Tiberius, Caligula took control and began constructing massive defenses. Caligula’s Wall is the greatest of these, meant to hold back the ever-present throng of dead moving against Rome from the east. From the wine-dark Aegean to the sea north of the Goths, this line consists of a twin-line of fortification with a river in between. The Rhine in the north and the Gaius Flumen, a new river dug to extend the fortification to the Aegean, stretches to the south. Along these twin walls are milecastles, each numbered and spaced five miles apart, each serving as an entry into the Dead Wilds and a blockade against it. They also have a second purpose of acting as a lighthouse along the frontier, helping to keep it marked and spread warnings; each milecastle has buckets of powdered metals they can use to change the color of the flames and signal neighboring towers. Last night, Milecastle 42, the next castle in the line, turned their signal fire red for danger. Minutes later, the fire was extinguished all together. This morning, right before dawn, your Milecastle Commander gathered you together to go find out why. This adventure has everything you need to get going fast and keep the action moving until the end! It provides enough historical information to run the game no matter what your level of historical expertise is. Character creation is sped up by providing a generic soldier template that the player can improve and specialize in his or her own way. That keeps set up time down, and gets the characters in the action faster! A fully detailed map has been provided by Alyssa Faden, and additonal art has been provided by Ari Syharazad! Enemies are detailed within, and there is a special surprise at the end of the adventure for the characters to deal with! Do you like the Roman Empire? Do you like sandbox adventures? Do you like adventures that leave you wanting more after pounding the table and getting rowdy? Look no further! 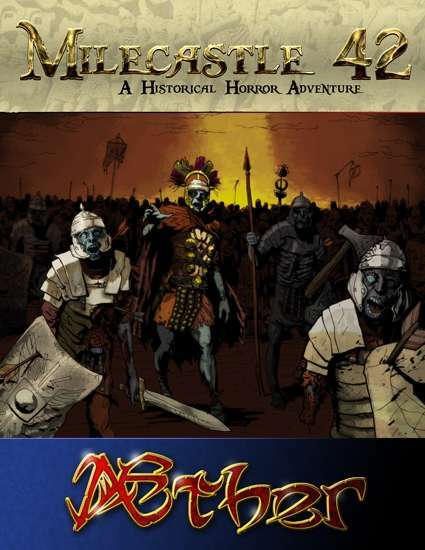 Get Milecastle 42 today!